Tim R. Fleck, 49, of Akron, Ind., passed away unexpectedly at 9:12 p.m. Wednesday, June 12, 2013, at Woodlawn Hospital Emergency Room in Rochester, Ind. He was born Nov. 13, 1963, in Wabash, Ind., to Ben F. Fleck and Sharon Gearhart Meenen. He was a 1982 Graduate of Tippecanoe Valley High School. He was a graduate of the Indiana Law Enforcement Academy. He had been the Akron Town Marshal for several years. Prior to becoming marshal, he had been on the Akron Police Department for many years. 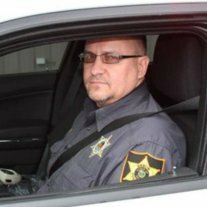 Before joining the Akron Police Department he had been a deputy on the Fulton County Sheriff’s Department. He was a member of the Henry Township Advisory Board. He was also a member of the Fulton County and Indiana F.O.P. He had previously served on the Akron Library Board and was previously a member of the Henry Township Fire Department. Tim was an avid Notre Dame fan as well as Tony Stewart fan and he loved John Deere. He enjoyed mowing and was very particular about his yard. He was preceded in death by his father; step-father: Howard ‘Bud’ Meenen; and his nephew: Jonathan ‘Popper’ Kamp. Visitation will take place from 2 p.m. to 8 p.m., Monday, June 17, at Akron Church of God 301 S. West St., Akron. Funeral Services will take place at 10:30 am, Tuesday, June 18, at the church. Pastor Terry Canfield will officiate. Burial will take place in Akron Cemetery, Akron. Hartzler Funeral Home is handling the arrangements. Memorial contributions may be made to Education Fund for Hana Fleck entrusted at Lake City Bank.